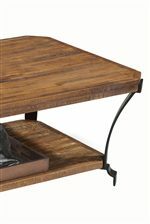 Crafted from reclaimed hardwoods and hand-forged steel, this accent table boasts a unique wedge shape that fits neatly in any space. Pair with the coordinating entertainment stand to create a versatile storage piece, or use as a traditional end or lamp table. An oil-rubbed bronze finish softens the steel base for a warm and intriguing finish. The Kenwood Wedge Shaped Occasional Table by Flexsteel at AHFA in the area. Product availability may vary. Contact us for the most current availability on this product. Wood & Finish Natural medium wood finish with color variation, and dark bronze oil rubbed patina on steel legs. Case Detail Hand-forged metal legs with angular shape. 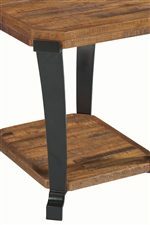 Description: Top Made of reclaimed hardwoods with natural distressing and color variation. The Kenwood collection will give your contemporary living room a cool rustic feel. This collection includes a variety of occasional tables to meet your needs and fit your space. Pieces feature table tops made of gorgeous reclaimed hardwoods with natural distressing and color variations. Angular legs are made of hand forged steel with a dark bronze oil rubbed patina. These pieces will give your living room an inviting and warm look that you and your family will love. The Kenwood collection is a great option if you are looking for Contemporary Contemporary furniture in the area. Browse other items in the Kenwood collection from AHFA in the area.